PGE Foundation, Marie Lamfrom Foundation, and the Portland Center for the Performing Arts. Click HERE for ticket and seating information. This ground-breaking production weaves a bittersweet love story within a mystery and features a haunting score of Native American music and traditional musical theatre songs. 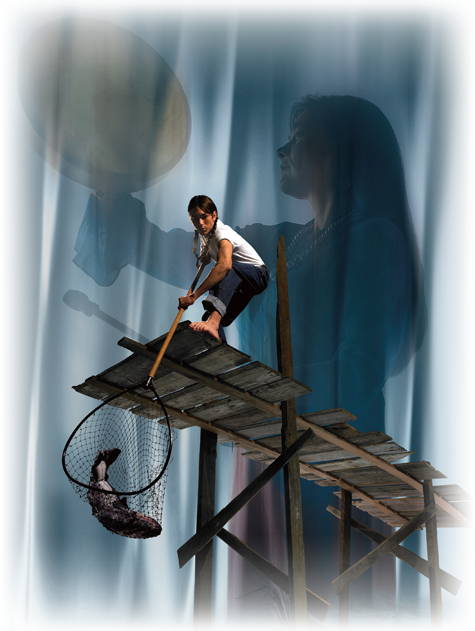 The Ghosts of Celilo (suh-LIE-low) is a musical play based on true events that happened near Celilo Falls in the 1950s. Celilo was one of the world’s premiere fisheries and a cultural and spiritual center for native people before it was inundated by the Dalles Dam in 1957. Ghosts features Native American music and traditional musical theatre genres telling the story of two Indian boys kidnapped and taken to a government boarding school. There, they are befriended by the white daughter of the school’s administrator. The three make a daring escape to catch their ceremonial first salmon before Celilo Falls is buried by the closing of the dam gates. This story is ‘remembered’ by four colorful ghosts who have been stuck at the bottom of the Columbia River for fifty years on the last remnants of fishing platforms that have been buried underwater where Celilo Falls once roared.